The apprtmet is great! Spacious. Clean and well equipped. Located in the center of Milan. The place was huge for 2 people. Very nice space. Nice decor. Didn't use the kitchen because we only stayed one night. Liked the location. Easy to walk to many places, very central. We took the Malpensa Express from the airport to Cadorna Station, then took the subway 1 stop to Lanza station and walked a few blocks to the apartment. Didn't arrive until about 7p but it was no problem. Staff met us at the apartment with the keys. They were very responsive and super helpful. Would absolutely stay there again if I were to stay in the Brera neighborhood. The location was excellent, near good restaurants, museums, lovely shops. The living room and bedroom were spacious and airy - really nice rooms. The furniture and decor was sensitively chosen. Altogether a really pleasant flat. The area is very nice, lots of restaurant and shops around. Loved the location in Brera, even La Scalla and Il Duomo were within walking distance. Staff were very helpful and accommodating with our questions and concerns (ie, parking, restricted zone payment, and luggage storage). Free coffee pods and bottled water. Amazing location, cozy apartment in the centre of Brera district only 5 minutes far from the subway. The flat was big clean and well furnished. Lock in a great price for Brera Apartments – rated 8.9 by recent guests! One of our best sellers in Milan! Centrally located in Milan, in the heart of Brera district, Brera Apartments offers elegantly decorated apartments with free WiFi. The Brera Art Gallery is 150 feet away, while the Sforzesco Castle is less than a 10-minute walk away. Lanza Metro Station can be reached in 5 minutes’ on foot. All units are tastefully decorated and fitted with modern furnishings and parquet floors. 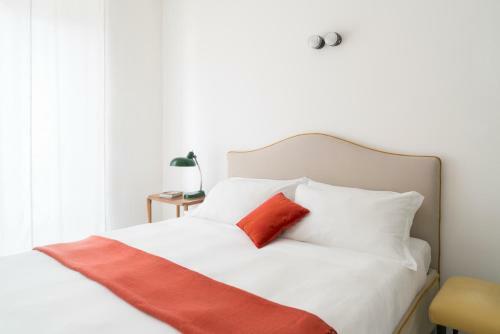 Each apartment is composed of a separate bedroom, a living room, a fully equipped kitchen and a bathroom with hairdryer, shower and free toiletries. Facilities include air conditioning and a flat-screen TV. You can find restaurants, bars and nightclubs in the area to enjoy Milan's vibrant nightlife. Brera Apartments is 1,650 feet from Montenapoleone shopping area and 1,950 feet from La Scala Theater. Milan Linate Airport is 5 mi away. This is our guests' favorite part of Milan, according to independent reviews. In this area you can shop 'til you drop for popular brands like Cartier, Gucci, Tiffany & Co, Hermès, Louis Vuitton. 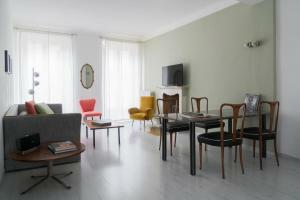 When would you like to stay at Brera Apartments? This elegantly decorated apartment is composed of a separate bedroom, a living room, a fully equipped kitchen, and a bathroom. Provided with air conditioning, it includes free WiFi, and a flat-screen TV . This smaller elegantly decorated apartment is composed of a separate bedroom, a living room, a fully equipped kitchen, and a bathroom. Provided with air conditioning, it includes free WiFi, and a flat-screen TV . This larger elegantly decorated apartment is composed of a separate bedroom, a living room, a fully equipped kitchen, and a bathroom. Provided with air conditioning, it includes free WiFi, and a flat-screen TV. This spacious suite is composed of a separate bedroom, a living room, and a bathroom. Provided with air conditioning, it includes free WiFi, and a flat-screen TV . 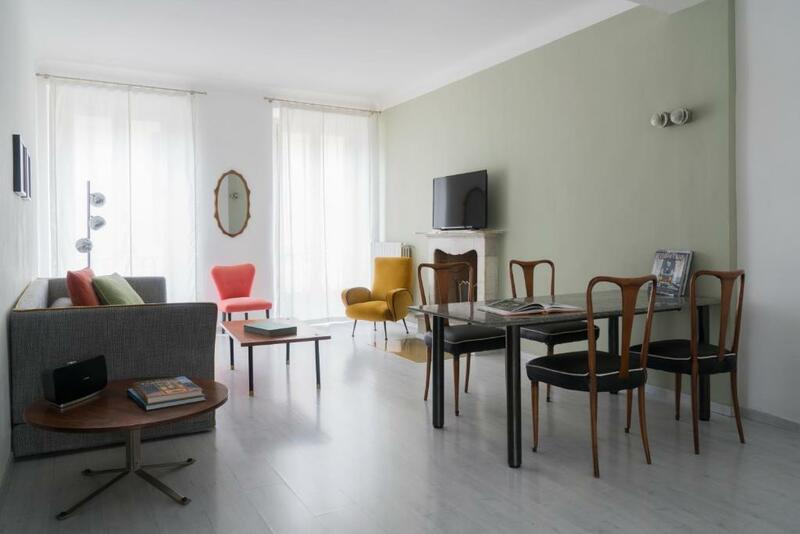 In the most beautiful and prestigious areas of Milan, our apartments are the ideal solution for business travelers and for experiencing the Milan of art, events and shopping. House Rules Brera Apartments takes special requests – add in the next step! Brera Apartments accepts these cards and reserves the right to temporarily hold an amount prior to arrival. Please inform Brera Apartments of your expected arrival time in advance. You can use the Special Requests box when booking, or contact the property directly using the contact details in your confirmation. It would have been really helpful to have a washing machine and we had forgotten to check this before we left. The street is a rather busy street with traffic but the double windows blocked out almost all the noise. It could be difficult in summer when you might want to open the windows and have a cross-draught. The apartment was really noisy – loud disco music from the next door pub spoiled atmosphere and lasted until 1.30 AM. This was the first night. Next day our host offered us another apartment in same price and the rest of the weekend was successful in a very silent environment. Didn't realize we were above a bar! Constant noise throughout the night and hardly had any sleep. The street is a bit noisy in the evening and at night. The apartment is located above a bar. There was a lot of noise until the small hours in the night. Main entry door downstairs would sometimes get stuck. The toilet was making a noise after flushing. Even though there was an attempt to rectify the mosquito problem it did not help and ruined our holiday experience in Milan. Walls were dirty because of previous people swotting mosquitos on the walls.